I’m not a huge animal person, except for small cute dogs. 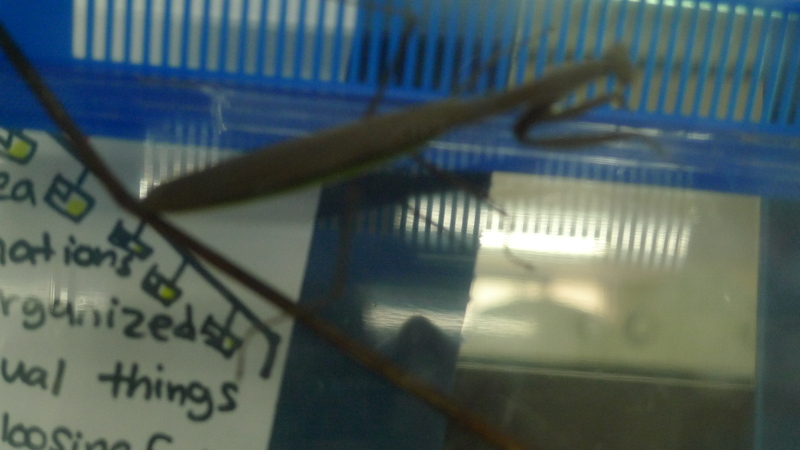 Yesterday, my student brought in a praying mantis he caught to share with our class. He wanted to keep it on his desk, which is right near me, and I told him to keep it in his cubby. During lunch, some of my boys were trying to catch dragonflies with the dragonfly nets. 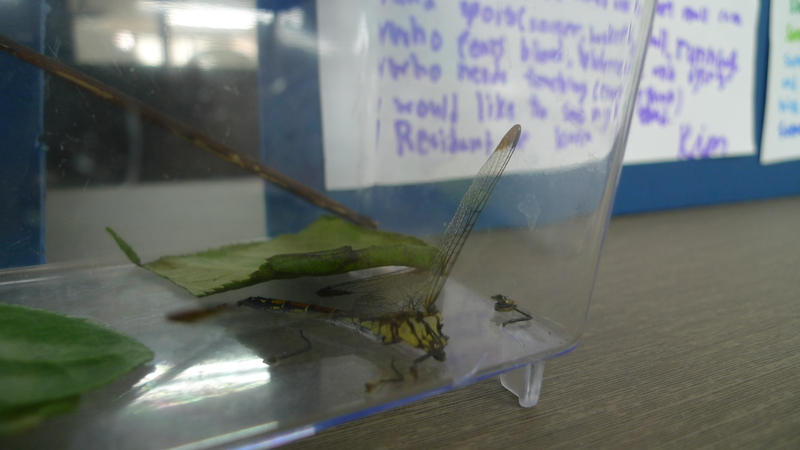 In the last few minutes of recess, my student catches a dragonfly and puts it in the praying mantis container that he brought with him. A few minutes later I hear the kids screaming and gathering around the container. It turns out that the praying mantis was eating the dragonfly and all my students were glued to this lovely feeding moment outside. My students shared with me how it violently ripped off the head of the dragonfly and the rest of the body was still moving around. As we gathered back inside the classroom, we discussed what had happened. 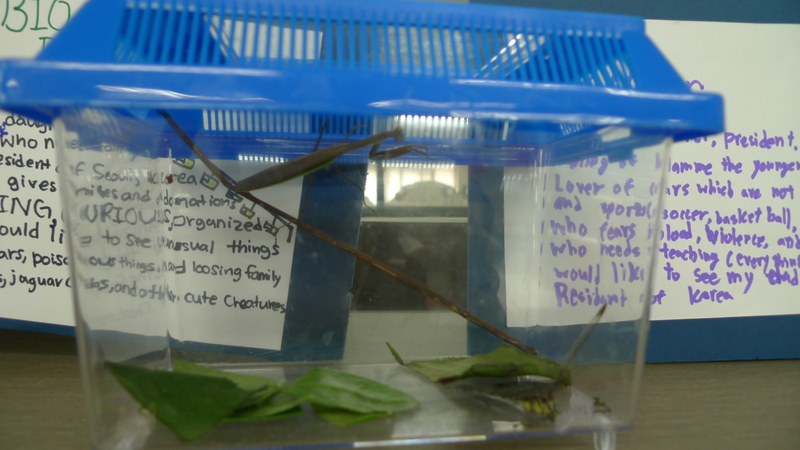 I told them that we could try to have the praying mantis as our class pet. However, they would need to do some research on what they eat and etc. Well, after doing some of my own research, I found out they are predators and like to eat living things and some are even cannibals. I think I prefer herbivores for classroom pets. This does not sound like a friendly insect that I want in my classroom. I’m secretly hoping that it has a very short life span. Well for the sake of my students, I will keep it around for a little bit longer, and hope I don’t need to come in close contact with it. The things teachers do for their students! It’s the circle… the circle of life! Those praying (preying?) mantis females are pretty vicious too! Ahh I remember watching insects do their thing. I agree. Let’s fill classrooms with peace even though kids love a bit of violence. You are way braver than me. A student tried to bring a gerbil to class once and I had to put the kaibosh on it. On the other hand, I’m allergic (and don’t like reptiles) to anything furry, fluffy, or feathery, so I’ll blame my reaction on that. I’m jealous! I love those kinds of instant lesson-teachable moment types of experiences. And I love insects….spiders….snakes….did I mention I teach preschool! I tend to FREAK OUT at these moments. And I feel like the fun police whenever a child asks to bring an animal; the answer is always no! You are a brave soul. haha, reading this was just as funny as hearing it in person love!